Needless to say, the entire convoy of people were now desperate for a shower and a few days to rest. We saw signs for Budapest and drove into the center of town. 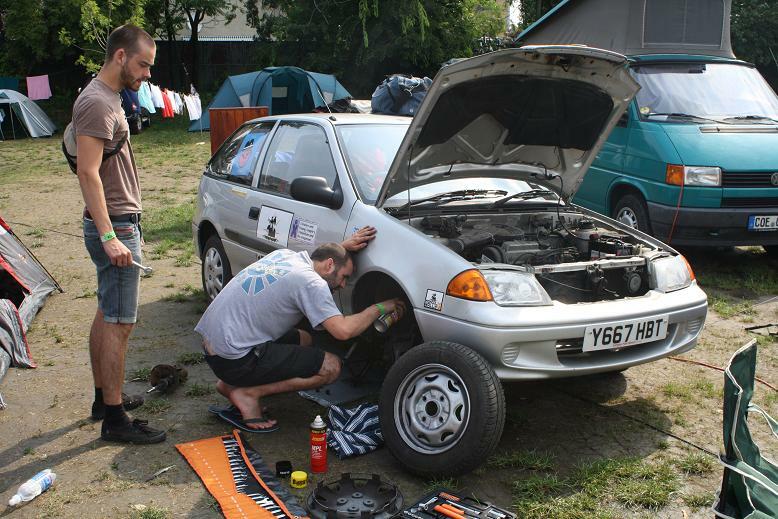 No hostels came up on Hostel World that were affordable and had safe parking, so just as we were debating jumping in the river with a bar of soap we got a text message from the Back flips and Summersaults team that had left the convoy in Czech. They had found a campground. We headed towards the park in the middle of town where the campground was. Taking a wrong turn into a parking lot, we made a three-point turn to get back on the main road. In front of us, the Face Race team was doing likewise. For some reason I saw the front left of the hood dip down and then Oly and Oli jumped out of the car and stuck their faces under the body of the car. I unbuckled my seatbelt and had a drink of water. I strolled over to see what was up. I could not have imagined how terrible the accident was. Making a three-point turn isn’t something I consider a hazard to a car, but apparently to theirs’ it was. As I rounded the corner I could see that the entire front left wheel had snapped off at the arm. Corroded medal was flaking off from the weight of the car. “Jack it up so it doesn’t snap the other side.” I yelled, and ran to the trunk and helped them unload their gear. Oli jacked up the car as Rikki and the other Oly got in a huddle and decided on their next move. I suggested that we take all of their gear and head to the campground so that their car was empty when the tow truck arrived. We loaded down our car and after some careful maneuvering with Bill at the wheel and Mike and I navigating, we got our car past the broken down one without damaging anything in the parking lot. It was as we were ready to pull out that the next problem occurred. A man and his wife and presumably one of their mothers exited the apartment building and got in their car…. Which was trapped behind the Face Race car. Because we could not move the car, and because these strangers drove an SUV, there was nothing we could do to help them. They called a tow truck and as Mike and I set off for the camp ground on foot, Bill drove the full car to the campground while Oli and Oly waited with the car. We checked into the camp ground and met two other rally teams. I set up our tent and we set up the Face Race tent as well, filling it with their stuff from our car. Two hours later they returned in their car, having told us that the mechanic charged them 400 dollars to fix the wheel on the spot in the parking lot. At least they were back on the road and still in the rally. We all celebrated that fact with a toast and, since they were not in the mood to party after their 400$ repair, we retired early.